Everything you need to know about pots for your Venus Flytraps! Venus Flytraps are small plants, growing to about 5″ tall or wide at maturity, so they don’t need pots that are very wide, but depth is helpful. Deeper pots allow for root growth. Root growth is helpful for the Venus Flytrap plant because longer thicker roots help the plant wick up available water and appropriate nutrients from the growing medium. With deeper pots and tray-watering (v. top-watering which is not recommended due to potential crown rot) the plant is forced to grow longer roots in order to reach the water. This encouragement of root growth is the same reason expert growers use the technique of watering their Venus Flytraps, then waiting until the growing medium has lost much of its moisture, before watering again. The plant is forced to grow longer thicker roots in order to take advantage of any moisture that is left in the growing medium, whereas if it the Venus Flytrap plant were left constantly sitting in water there is no motivation to grow longer thicker roots because water is easily and readily accessible at all times. It’s sort of like a military boot camp where you’re forcing your Venus Flytrap to get tough and strong, by not pampering it too much. Of course you never want your Venus Flytrap growing medium to go entirely dry, but making it work for its water results in a stronger tougher plant. The type of pot then that you choose for your Venus Flytrap can encourage or discourage root growth. A minimum of 4″ in depth is necessary so that the rhizome or “bulb” of the plant doesn’t get too much water, and the roots can develop at least somewhat. Any height taller than that minimum is optimal. Venus Flytrap roots can grow to around 12″ or so with some variation, so a pot that is slightly taller than that forces the roots to really bulk up and lengthen. If you see roots from Venus Flytraps that have been in taller pots and have not been overwatered, they’re incredibly thick and long, like Venus Flytrap dreadlocks! For the width of the pot, more space is helpful in terms of insulation The more soil that is in the pot, the more the rhizome of the Venus Flytrap is insulated from extreme heat and cold. Venus Flytraps are great in temperatures between about 40-95F, but can get overheated or freeze in extreme temperatures. Venus Flytraps, especially those with larger rhizomes, more mature and older, can actually survive a frost/freeze or two, though they’ll likely lose their foliage up top until the growing season starts again in Spring. The more growing medium that surrounds the rhizome, the more insulated it will be against extreme conditions, so that the cold and heat and less likely to reach the rhizome at their full intensity. Growing medium for Venus Flytraps can add up in cost though, so really realistically, you just need 2 inches or so around each side of the rhizome, and 6 inches outwards of the rhizome in each direction is really nice insulation. In the most extreme of temperatures, of course, all the insulation in the world won’t keep the plant from freezing, so there is a point where you bring the Flytrap inside of course. In terms of pot/container types, you want to again look for insulation, so glass is definitely out, because it magnifies the heat/cold coming at it. Ceramic is not great either. Plastic is fine, especially thick plastic. Fiberglass is great, especially thicker fiberglass. Whatever the type of pot, just consider the insulation, especially as related to the extremes of weather where you live with your Flytraps. It’s not a big deal, actually, the insulation thing, because most growing locations don’t have extreme temperatures most of the year. But to be safe, it’s good to prepare for extremities, and pot your Venus Flytrap in a pot with good insulation and good space for growing medium that can insulate it from unexpected or temporary extreme weather conditions. In terms of the growing medium for the pot, and calculations for insulation possibility, you’ll want to keep in mind that although a peat moss type of growing medium doesn’t encourage the growth and transplant recovery like premium long-fibered sphagnum moss does, it does insulate a little bit better. So your calculations will involve 1) temperature extremes in your area, 2) insulation of your pot, and 3) insulation of your growing medium. You can decide based on these factors what type of pot you will choose. If all of this seems complicated, please know it’s actually not, we’re just going into depth because we’re trying to cover all the details. But it’s really not terribly complicated. Just check on your Flytrap by feeling the outside of the pot – if it feels uncomfortable to you then it’s uncomfortable for your Venus Flytrap, too, either too hot or too cold. Adjust accordingly. Great-case scenario, honestly, is one of those taller white Styrofoam cups. They insulate great, they’re white so they reflect some of the heat back outward, and they’re cheap. 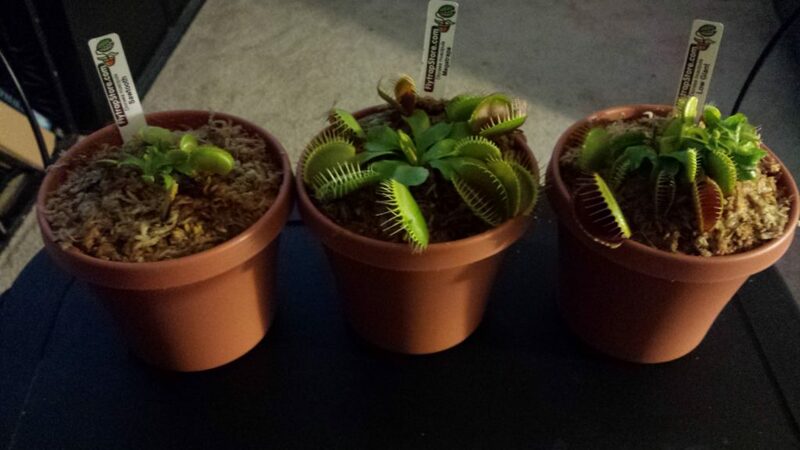 They are terrible for the environment, but honestly it’s a decent and easy option to serve as your Venus Flytrap pot. A last note, please for the love of Venus Flytraps, do not place your pot in a terrarium, which is a death trap for your Flytrap. Or geez forbid one of those domed situations that are touted as Venus Flytrap habitats. A covered pot is only good for growing seedlings, not for Venus Flytrap plants older than that. You’re just asking at that point for rot and disease. Let your Venus Flytrap in its pot be outside in the glorious sunshine with the glorious air movement. It’s best for its health, I promise you. And probably humans too!